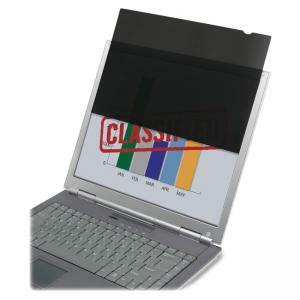 Made using quality 3M materials, frameless privacy filter for LCD desktop and notebook monitors allow you to keep classified or sensitive material from being viewed by others. Privacy filter protects screens from scratches and fingerprints and also minimizes glare and reduces eyestrain. Easily install or remove with no harm to screens. Filters stay in place when your notebook is closed. Privacy filter is 100 percent recyclable. Packaging is made using 100 percent recycled content.